← More Historical Bad Boys: Prospector Has Standoff with the Malaspina Glacier Beast. Welcome to chapter five of Sasquatch Tracker’s Historical Bad Boys. We are continuing to look at tales of Alaska’s wild men and their sometimes violent encounters with people. 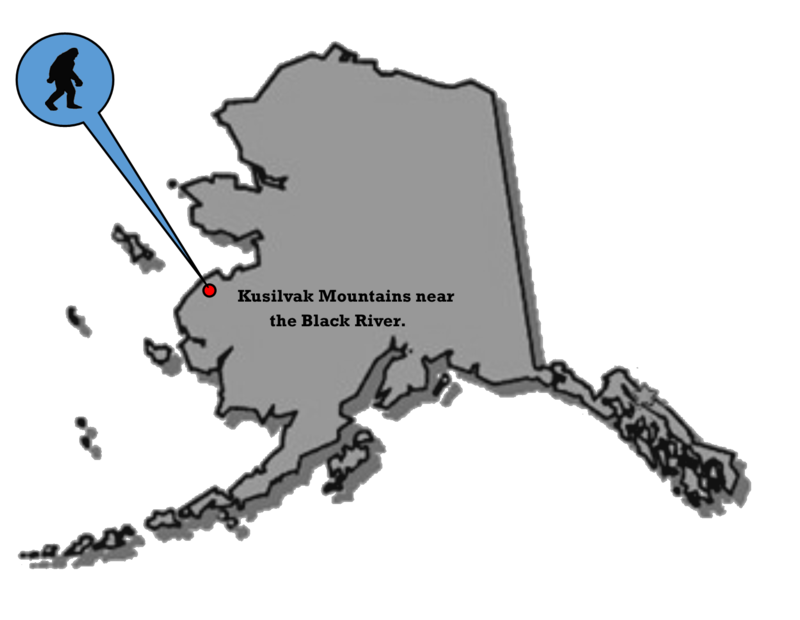 This time, let’s go to the northwest side of Alaska and learn about the Kusilvak Mountain Hairy Man. Created by Sasquatch Tracker, 2016. 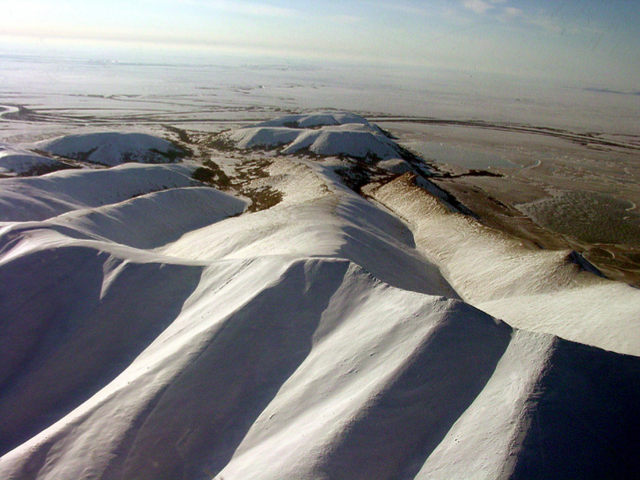 Kusilvak Mountains on the Yukon Delta. Credit: USFWS, Public Domain Image. One day a hunter decided to travel up the Black River a bit to do some moose hunting. He anchored his boat near Kusilvak Mountain. Like all hunters, this particular fellow decided to head for some high ground to survey the area. He grabbed his rifle and climbed out of the boat. Once he was ashore, he climbed the bank and began to hike. After a bit of hiking, the hunter paused and looked around. As he surveyed the area, he quickly noticed some kind of animal that was not too far from where he stood. The hunter began to study this animal and suddenly realized he was looking at a Hairy Man. Then it happened… The Hairy Man was aware of the hunter and apparently decided he had had enough of being looked at. The Hairy Man suddenly squared off with the hunter and began to rush him. Of course, the hunter had to be terrified. He probably doubted what he saw for a heartbeat or two and then his mind began to race as he realized that imminent danger was not more than a few yards away. As the Hairy Man charged, he made “terrible sounds” (Anon in Delta Discovery, 2013). The hunter did not relay how far he was from the Hairy Man when this took place, but there was enough distance that the hunter had time to raise his rifle and fire a few frightened shoots. If the hunter had struck the Hairy Man, it had no effect. The Hairy Man continued the charge. The hunter fled in terror. He scrambled his way back to the boat and pulled the anchor as he gave the boat a mighty shove out into the current before jumping in. He was able to start the motor and come about just as the Hairy Man reached the bank where he had been mere heartbeats before. The Hairy Man was not amused. He roared what could only be taken as a deadly threat and swung his arms at the hunter as he quickly retreated downriver. It was over as quickly as it had begun. The hunter was afraid and rightfully so. He never returned to the spot where this happened. In fact, he would never venture up the Black River again. I consider the hunter fortunate. Just like Frank Howard’s encounter with the Malaspina Glacier Beast (last week’s post) things could have deteriorated quickly. Of course, we can only speculate what would have happened if the hunter had been overtaken, but considering the behavior of the Kusilvak Mountain Hairy Man, it probably would have ended in tragedy and the hunter would have been added to the list of people who have disappeared in Alaska’s wilderness. I have a few questions like I always do: Why did the Kusilvak Mountain Hairy Man react this way towards the hunter? Was he reacting to the hunter as an Alpha Male and defending some “territory” or perhaps other Hairy Men the hunter did not see? Could he have reacted in surprise when he became aware of the hunter or was he just “having a bad day” and the hunter happened to become the target of hostility? Like all the other tales we have looked at so far, reports of sightings and tracks being discovered in this area of Alaska continue to slowly make their way to the Sasquatch Tracker. Anon, n.d. A Hunter Chased Away by a Hairy Man, by the Delta Discovery Staff, 2013, The Delta Discovery, June 5, 2013, Volume 15, Issue 23. Online: www.deltadiscovery.com/story/2013 (Accessed 01MAR2016). This entry was posted in Historical and tagged Boreal Sasquatch, Historical, Other Behavior. Bookmark the permalink. Why do Alaska Sasquatch seem to be more aggressive than their lower 48 counterparts? Maybe because they don’t come into close contact with humans as much? It could be a number of reasons… Alpha male protecting a few that aren’t seen (females and young) or territory guarding are just a few reasons that quickly come to mind….